Buzzwords, phrases, acronyms, concepts … the migration to the next Industrial Revolution is already full of jargon. This video aims to cut through the complicated terminology and provide a practical starting point with an actual connected asset to begin your journey with the Internet of Reliability. Hey there, reliability team. Welcome back to your second official episode of Noria’s brand-new web series called "The Internet of Reliability." I'm your host, Jeremy Drury of IoT Diagnostics, and we're here to be your guide on getting your reliability programs connected to the internet and ready for Industry 4.0. We're going to give you these quick, fast episodes of good facts and tangible strategies on getting you connected and ready. If you recall the last episode, we were out in the big shop and were talking state of the market. 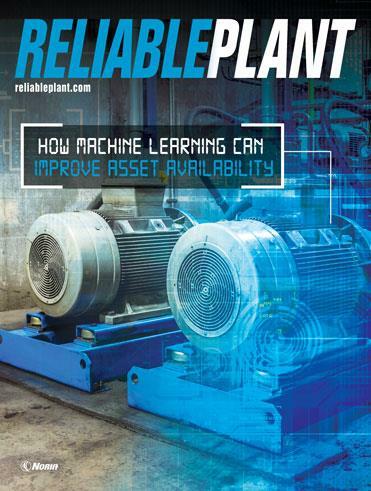 We were at a real high level trying to convince you that it's OK to go ahead and take this step into this Internet of Reliability and Industry 4.0. Today, we're going to get real practical, real quick. I felt that was the best way to talk about what Industry 4.0 is and what the internet of things (IoT) represents. Let's talk about an asset, let's get it connected and show you what it looks like. If you look at the table here, I'm sitting next to a behemoth of a small, robust pump. This is a fixed-speed hydraulic axial piston pump. For those of us who are in the hydraulics space, we know that these are bulldogs when it comes to operations. They're hyper-reliable because they need to be for production. Typically, we would find that these pumps go down at the worst possible time — right in the middle of a production run or early in the morning on a weekend. They cause a lot of headaches. We love them. We hate them. We get it. You've been able to do reliability maintenance, reactive maintenance, perhaps even preventive maintenance on these historically with body parts. You can either listen when a pump is running to hear how it sounds, or you could put a hand near it to see if it feels hotter than usual. You want to get into flow measurements? Grab a hose, a stopwatch and a bucket, and do your best attempt at trying to measure a flow rate. That works most of the time, but it’s not that reliable and it's hyper time-conservative. And no one has just one piston pump onsite. You typically have tens if not hundreds of these. That's a lot of time for someone to be going around and doing that kind of personal, intimate maintenance — until now. So, I felt the best way to do this was to show you an IoT device that's actually plumbed up to an actual piston pump. What you see here is that this device is bolted right onto the case drain of this actual piston pump. Through research, it's shown that it's a great place to actually check diagnostics for pumps like these. The way that this would work is you would pump up this device. It looks about the size of a late ’80s or early ’90s cellphone. You would actually power this one up with electrical power. There are some IoT devices out there, perhaps on less critical applications, that could be battery-powered. That's something to keep in mind. This one would go direct in line into the application. So, via the case drain, fluid would actually be consistently passing through this device, touching all the sensors that are embedded in here. These sensors are going to help you measure things like pressure, temperature and flow coming out of the case drain of this pump with the sensor embedded in here. In addition, you're going to see these visual indications here that show — actually via these LCDs — the status of those different things. OK, let's say we're plumbed up. So, we've got the device bolted onto our pump here. We've got it powered up. As you can see, electricity's flowing through here. The device is live. Let's say in a scenario, this device — the pump — is in operation, and it's working. As it begins to operate, the sensor goes live. It begins to start to measure what's going on with the hydraulic oil that's going through here. As it's making these calculations to let you know which one of these different diagnostics are going on here, the calculations are actually being done on the device. For those who like vocabulary, this is what would be called "at the edge." This technically could be an edge device or something on the edge to get diagnostics out of this pump. The way that you would actually use this is you would wire this via analog into your local PLC or SCADA. You could see the data come alive right then and there. Now, as you've heard me say before, I'm an IoT purist. To me, that would be more on the machine-to-machine kind of communication, which is fine, if that's where you want to start. But let's say you want to go 2.0, and you actually want to get this data up and out of the building. There's a lot of value to that, which I'll get to in a near episode here soon. You could push the data calculations that are happening on here to the cloud. And via the cloud, that data is going to be held, and perhaps even more advanced calculations can be done there. Then, that is going to be redistributed to any trusted party, whether inside or outside of your business. You do that so you have the flexibility to do local calculations, cloud calculations, whatever works best for you. So, we've got the data part of this. OK, we've got the hardware plumbed up and bolted in. We've got the software. The data is being moved at this point. We've got data that's happening in real time. These are just some visual indications here. Another great thing about an IoT device is that you can see trend data coming out of it. You can look back over a time series and see things from one point of time to the other — how your pressure has changed, how your flow has changed and then even how your temperature has changed. That's going to help you understand maybe scenarios, outcomes or events associated with the operating timeline of this pump to make better reliability preventive maintenance verifications and validations on when or if this pump needs to be maintained. Now, something that's critical about devices like these is that they need to be calibrated specifically to the pump’s model code or asset model code. The reason being is, as this device would learn about the operations, it needs to be able to be specific to set its baseline. You need to know what the baseline of this current pump is to get the right kind of diagnostics out of it. This way, you're not allowing false positives to enter your data stream or making inferences on different types of pump models that could be more specific to this one. You see the great benefit of all this is over time. As this device and other devices like it learn, you're going to be able to start doing this thing called "predictive maintenance." OK, so imagine a thousand of these types of devices are on pumps all around the world and are very similar — same model code as this pump. You'll start to see predictive algorithms come to life, where maybe four weeks before a pump failure, things like trends, pressure, temperature and flow start to change in a common way that you could be alerted to a scenario like this weeks in advance, allowing you to pivot and swap out the pump and get it serviced on your time, not at the worst time. That's the main benefit of Industry 4.0 when we start to plumb up these kinds of assets with IoT type devices. I'm going to stop there today. I know it's a lot of information, but we'll get back to it real soon. Again, I'm your host Jeremy Drury. This is Noria's brand-new web series called "The Internet of Reliability." We're happy to get you connected, and we're going to boost those reliability operations for you with predictive maintenance and connected devices. Thanks.